By now, the re-purposing of the “Old Sears Building”/”City Hall East” as Ponce City Market is practically synonymous with the BeltLine itself. Sitting about halfway along the East Side Trail at Ponce de Leon Ave., the largest building redevelopment in the city promises to be something of a dream come true: retail and restaurants, a food market, office space, residential units and plenty of room to park your bike. So when do we get to see it?? 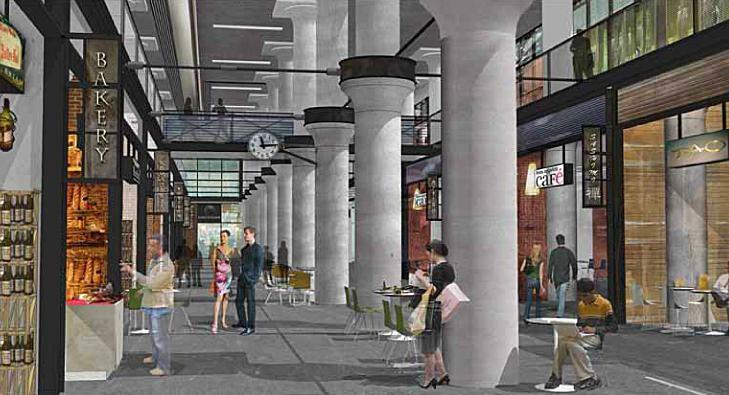 As with most development opening dates, Ponce City Market’s (PCM) opening has been pushed back a couple times, the “flats” (259 pet-friendly apartments in both the east and west wings of the building) are already on the market for pre-leasing and according to latest projections, eateries within PCM’s Central Food Hall should start opening for business by early 2015 though reports from June say the first commercial tenants at PCM should be opening by late summer 2014 (note: “late summer” could be interpreted pretty broadly if need be). The complex is bounded by Ponce de Leon Ave. and North Ave., Glen Iris and the BeltLine. It was bought in the summer of 2011 by Jamestown Properties, the developer responsible for Chelsea Market in NYC and work has been steady ever since with the first tenant, Dancing Goats Coffee Shop, opening in August 2012 in one of the complex’s auxiliary buildings (previously an auto service center for the police force housed at City Hall East). The rest of the property has been landscaped into parking, windows have been restored, hefty concrete floors removed to create expansive public spaces and the rest of the 2,100,000 square foot interior has been built out to house all the promised amenities. In June of this year, work started on the North Avenue Plaza, a space along the BeltLine where folks can step off and relax at tables and benches under new trees. The existing shed building we hear, will also be majorly renovated and serve as a long outdoor deck and an entrance to PCM. While the Boiler Building, a low-rise auxiliary building at the moment, will also feature PCM-BeltLine amenities (see image below) and ultimately be a 16-story condo tower though that is several years down the road. Plans show stairs and an elevator at the south end of the Plaza area will provide access to North Ave below. H&F Burger – Linton Hopkins, paired with H&F Bread Co.
For more on food at PCM, including particulars about restaurants having a “market” aspect to their shops, see this article in Atlanta Magazine. And of course the Flats at PCM office is open for leasing next to Dancing Goats. Emily Cavett Taff works in historic preservation but is keenly interested not just in the fabric of our urban environment but in how we get around it. She lives in Reynoldstown and commutes by MARTA, bike and car to her job in Midtown. She has done her share of exploring and researching the beltline since 2009 and is very proud of Atlanta for realizing such an amazing dream.